Get everything for you, your family & your home, all designed to fit your personality and budget. Shop in store, online, on your mobile device or at a kiosk. Our hassle-free return policy means you can return any item, anytime, for any reason. 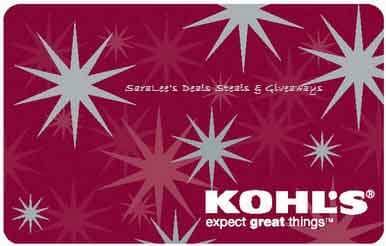 With Kohl’s, you can expect great things and if you win this giveaway, you can expect $50 worth of Gift Card from Kohl’s. Isn’t that amazing? Disclaimer: Please note that SaraLee’s Deals Steals and Giveaways and Work Money Fun are not responsible for prize fulfillment. I love that Kohls always has a coupon code to go with their great sales!